Brazen Booze Thief Busted, Says, "I Hustle That's What I Do." A Louisiana woman yesterday surrendered to police after video of her brazen theft of booze from a Shreveport liquor store was released by a local crime stoppers group. Sekonie Jones, 37, was booked on a misdemeanor theft charge and subsequently bonded out of jail. As seen in the above surveillance footage, Jones last week swiped numerous bottles of alcohol from the Thrifty Discount Liquor & Wines store. It appears that security personnel were familiar with Jones since cameras began following her upon her entrance into the business. Jones--wearing a t-shirt with the words “Too Glam To Care”--stuffed bottles in her bag, bra, and underwear. Jones appears to have been aided by a younger woman. 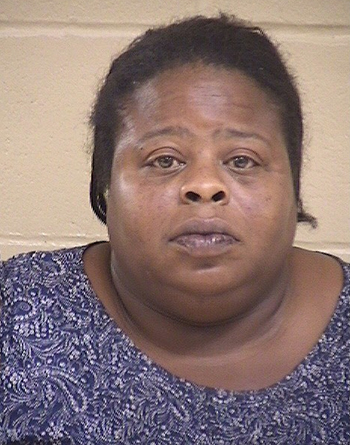 When video of her antics was distributed, agents with the Shreveport City Marshals Office and Louisiana State Probation and Parole Office identified Jones as the culprit. The investigators were familiar with Jones since her lengthy rap sheet includes convictions for disturbing the peace; criminal damage; driving without a license; drinking in public; and five separate theft cases.